Brothers and sisters share a bond that is unlike any other relationship – they typically grow up in the same home, with the same parents and similar genetics, and experience life events together. It would not be surprising, then, to learn that siblings have important influences on each other that show themselves in many ways. Siblings may teach each other directly, and they might model both good and bad behaviour. Siblings share limited parental resources, and so the time, attention, and money directed towards one child may be time, attention, and money diverted away from another. And, of course, because of these spillovers, policies that affect one child in a family may well have important effects on other children as well. Ignoring sibling spillovers might therefore cause us to underestimate the effects of policies targeted at children who have brothers and sisters. Despite the policy importance of understanding these relationships, there exists very little evidence about the causal effects siblings have on one another, even though child differences within the family have been well documented. For example, there has been a lot of research looking at how differences in birth order affect children’s outcomes in education, IQ, income, personality, and even criminal activity (Black et al. 2005, Price 2008, Black et al. 2010, Breining et al. 2016). This research gap exists in part because it is particularly difficult to distinguish causal relationships from correlations when dealing with siblings. They have the same parents and typically experience a common environment, making it hard to distinguish the role of environmental influences from sibling peer effects. Siblings may also have feedback effects on each other – my outcome affects my sibling’s outcome, and that affects my outcome in turn – making it even harder to causally identify the spillovers. Some researchers have tried to tackle this challenge. Recent work by Fletcher et al. (2012) and Breining (2014) using US and Danish data, respectively, attempt to answer this question by comparing first cousins if one cousin has a sibling with a disability while the other does not. Because cousins share a range of genetic features, and grow up in similar environments because their mothers are sisters, the authors are able to account for many factors that could explain disability status as well as child development. Both studies find that a child’s disability worsens outcomes for siblings. Work by Qureshi (2017) and Joensen and Nielsen (2017) using data from North Carolina and Denmark, respectively, addresses this question by studying the effect of exogenous boosts to the educational outcomes of older siblings on the younger siblings. Both papers find positive direct spillovers. In a new study, we use a different strategy to identify the effects of one sibling on another by examining families in which one child experiences a shock to his or her health, and estimating how this shock affects the existing children in the family (Black et al. 2017). Because certain families are more likely to experience these health shocks, we use an identification strategy that looks within families and compares first two siblings. Due to birth order, the younger one is likely to be more affected by a common sibling spillover than the older one. As above, there is a well-established literature that documents the existence of birth-order effects. This means using a sample of families with three or more children, in which the third child has a disability. To abstract from these effects, we compare these differences in outcomes between second-born and first-born children when the third-born has a disability to the equivalent difference in a similar three-child family where the third-born does not have a disability. We use data from Florida and Denmark, and find evidence in both locations consistent with there being a sibling spillover. 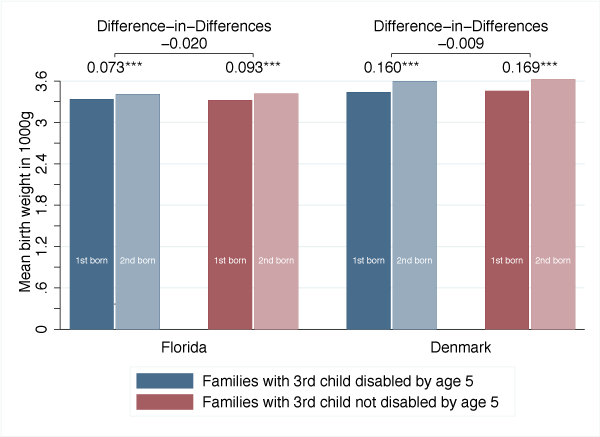 Specifically, in both contexts, the second-born child in a family has worse outcomes (test scores in Florida, grade point average in Denmark) than his or her older sibling when the third-born sibling is disabled compared to the case in which the third-born sibling was not disabled (see Figure 1). The magnitude of these differences is significant – and policy relevant. For example, in Florida it is about half the relationship between an extra year of maternal education and children’s test scores. These effects are concentrated in cases in which the third child’s disability is observed early, and therefore, presumably, more likely to affect younger siblings in early childhood. In addition, these results are more pronounced in the case of physical disabilities – which are likely to be more visible early and potentially impose larger burden on family resources – rather than cognitive or behavioural disabilities. To rule out a pattern of declining health in a family in which the third-born child has a disability, we also estimate our models for neonatal health outcomes, and find no evidence of differences in either birth weight or other birth outcomes (Figure 2). This suggests that the differences that are present in schooling outcomes are not due to underlying declines in health capital in families for which the third child had disabilities. Looking at data from the US and Denmark provides a number of important insights and broadens the external validity of our findings. The US and Denmark have very different educational systems, healthcare systems, and social welfare systems. The fact that we found comparable findings in different environments increases our confidence that our results are more broadly generalisable and more generally reflect spillovers within the family, as opposed to reflecting something context-specific. Disability is measured differently in the two locations – in the education record in Florida and on the medical record in Denmark – which again aids in establishing that our findings are likely to be generalisable. What are the mechanisms through which these sibling spillovers operate? We think of the primary factors as being time and money. Time: if a disabled younger sibling requires time-intensive attention, such as additional medical visits, home-based therapies, or increased parental care, then there would be fewer opportunities for families to invest time in their older children. Money: if disabled siblings require costly therapies or equipment, or reduce parental labour supply, there are be fewer financial resources to invest in older children. In both cases, we would expect the middle child to be more directly affected by a disabled younger sibling than the oldest child in the family, because the oldest child would be older by the time the third sibling’s disability becomes apparent. To examine the potential roles of these mechanisms, we perform heterogeneity analyses. When we stratify by socioeconomic status we find that, in Florida, the negative effects of disabled younger siblings are concentrated at the bottom of the SES distribution (where financial resources are more likely to play a role) and in the top of the SES distribution (where time resources are more likely to play a role). 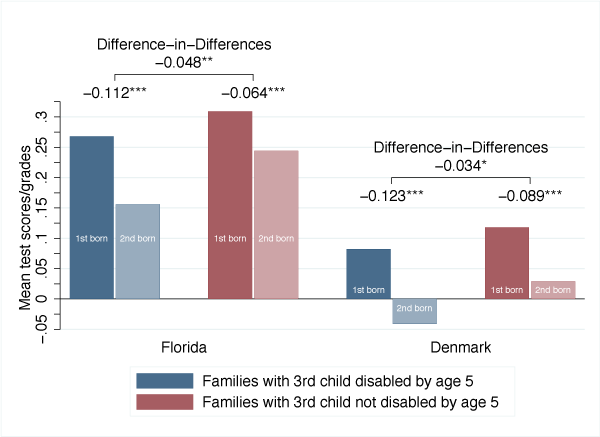 In Denmark, on the other hand, the negative estimated effects of disabled younger siblings are concentrated in the bottom two-thirds of the SES distribution. We don’t know what causes these differences between Florida and Denmark for certain, but evidence suggests differences in the context. In Denmark, families live closer to grandparents than is the case in the US. We find that the negative estimated spillovers in Denmark are driven by parents who live in different municipalities from the maternal grandparents. Another possible explanation is that high-SES Danish families have more access to public resource supports than do high-SES Florida families. In sum, we suspect that both time and financial resource explanations are responsible for the sibling spillovers that we observe in both contexts. We have found compelling evidence of spillovers from one sibling to another. This has direct implications for research into peer effects, but also for policy directed at families. Human capital policy interventions and resources frequently consider the benefits for the children themselves, but are less likely to consider spillover effects for the family. Investments that relieve the effects of negative shocks to children are likely to have larger benefits, but to see them, we need to consider the effects on the entire family. Black, S, P Devereux and K Salvanes (2005), “The more the merrier? The effects of family size and birth order on children’s education”, Quarterly Journal of Economics, 120(2), 669-700. Black, S, P Devereux and K Salvanes (2010), “Small family, smart family? Family size and the IQ scores of young men”, Journal of Human Resources, 45(1), 33-58. Black, S, S Breining, D Figlio, J Guryan, H Skyt Nielsen, J Roth and M Simonsen (2017), “Sibling Spillover”, NBER Working Paper No. 23062. Breining, S, (2014), “The presence of ADHD: Spillovers between siblings”, Economics Letters, 124(3), 469-473. Breining, S, J Doyle, D Figlio, K Karbownik and J Roth (2017), “Birth order and delinquency”, NBER Working Paper No. 23038. Fletcher, J, N Hair and B Wolfe (2012), “Am I my brother’s keeper? Sibling spillover effects: The cased of developmental disabilities and externalizing behavior”, NBER Working Paper No. 18279. Price, J, (2008) “Parent-child quality time: Does birth order matter?”, Journal of Human Resources, 43(1) 240-265. Qureshi, J, (2017) “Siblings, teachers and spillovers on academic achievement”, Journal of Human Resources, forthcoming.